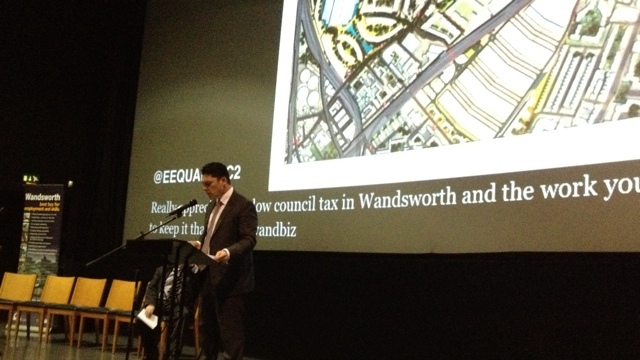 Not the most exciting image from last week's Wandsworth Business Forum. That’s not to say business is ignored; we do plenty to communicate with businesses, each town centre has a council employed Town Centre Manager, working with the local town centre partnership. We have links with the major business and trading associations. We regularly communicate and consult with businesses. But there hadn’t been a strategic voice for business until recently. We held the Wandsworth Business Forum last week (another ‘service’ we give businesses, an information and networking event) and formally launched the Wandsworth Business Partnership. Last night the Partnership held its third meeting and elected its first chairman from the private sector (I had acted as chairman while it was established). Why is it important? Well, the borough’s business has never had a strategic voice with the council. But arguably business is a key part of what makes the borough great. Most people form an opinion of an area not on the neighbours, or the quality of the housing, but the nearby retail offer. If you have ‘nice’ shops, you think it’s a nice area. If the nearest parade can only offer cut-price drink, gambling and kebabs you might draw a different opinion. Business brings people and money into the local economy. Without it Wandsworth would be a dormitory, where people slept when they weren’t working elsewhere. And the irony is that businesses, arguably, are the biggest funders of the council. While localisation of business rates is still a year away, and technically business rates are paid – ultimately – to HM Treasury the fact remains that the amount the Treasury pay to councils (which massively outweighs the money councils raise themselves) comes from somewhere and is remarkably close to the amount businesses pay in rates. Businesses find themselves paying a lot in taxation, but getting little representation. This article on O2, Westminster and Kensington and Chelsea’s plan to introduce free wifi is mainly focused on residents, but highlights the importance of a strong business voice. It is exactly the sort of project that could help Wandsworth’s emergent creative sector to thrive by giving it a competitive edge, but hitherto we haven’t had a body that could either call for, or support, strategic projects like that. It will be fascinating to see how the Wandsworth Business Partnership develops and works. (I sometimes wonder if we are just going through a corporatist cycle of government, and couldn’t help think of the Neddys.) I know it won’t always see eye-to-eye with the council – if only because it has chosen parking policy as one of its initial priorities – but on the other areas, like attracting investment to the borough or the creation of employment space we would hopefully be of one voice and seeing some exciting times together.